Inspired from the texture and grain in granite and stone, this Marbled Lokta Origami Paper features veins of metallic gold, silver and copper flowing against the handmade mint green Lokta paper. 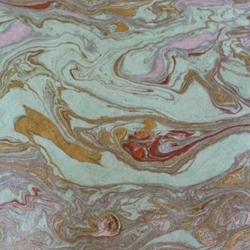 Both the paper and the marbling are crafted by hand by paper artisans in Nepal. Inspired from the veins of texture in granite and stone, this Marbled Lokta Origami Paper takes natural designs to a whole new level with bright and metallic colors. Intricate marbled patterns in glittering gold, silver and copper flow across each mint green colored sheet creating a one-of-a-kind design on each and every sheet of paper.